Do you really need Bangladeshi web Hosting company? If you do a Google search for Bangladeshi web Hosting the number returned is unbelievable. Just because you are from Bangladesh does not mean you have to buy Hosting from Bangladesh. The general thought is if you are from Bangladesh and you are searching for Bangladeshi web Hosting, you are probably looking for a programmer or a web designer who could do some programming for you or even build a website for you and upload it to your hosting company. It is understandable if you are looking for a web developer or a programmer in your area because, when the company you do business with is in your own hometown you feel more comfortable with that and also contact is more personalized rather than having to be in contact via the phone or net. Registering an account with a Bangladeshi web hosting company is alright, but they will probably be a small company with limited features but who will charge you quite a bit for it. 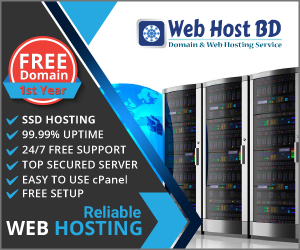 Limited features in this case may be limited web space and limited bandwidth – two of the most important features in a web hosting company. These limited features maybe an option if you are hosting a website just for pleasure but if you are having a website where you will be having a lot of visitors and a lot of pages then it may not be a good idea. Some of these hosting companies will allow you the option of increasing your bandwidth to accommodate your needs but they will definitely charge extra for this. So do you really need to go with a Bangladeshi Web Hosting company? If you want hosting that does not charge extra for bandwidth, if you want hosting that does not have limited features, if you want hosting that offers coupon codes and special rebates which makes hosting almost $0-1 then see our hosting plans now.